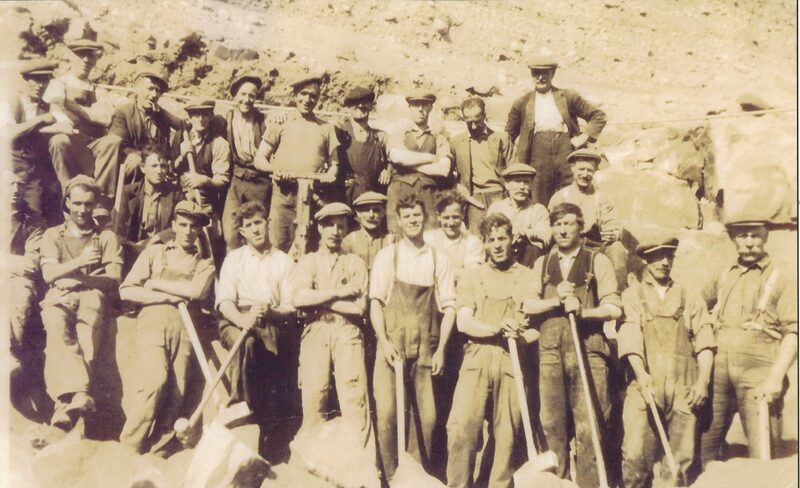 Quarrying in Balintore, 1930’s. Names from Nan Hodson. Back Row, left to right as viewer looks. from Shandwick, William Vass [Goatie], not known [pipe], not known, Di Vass, Hugh MacKay [Roggle] [with drill, the monkey man], not known, not known, not known, Dan MacKenzie [Raw]. Middle Row. not known, from Balintore, From Balintore. Front Row. not known, not known, John Tarrel [with hammer], Donald Duncan [with hammer], from Hugh Street, from Hugh Street, not known, not known, Andrew Mackay [Young, Ecky MacKay’s brother], Dan McAngus [Nan’s father], William Skinner, Katie Bell’s father?, Ken Hugh Vass [Oart].